The 2014/15 Royal Opera House Season has been announced. The Royal Opera’s Season will feature seven new main stage productions, including Martin Kušej's Idomeneo and Katharina Thoma's Un ballo in maschera. Productions in revival include Der fliegende Holländer, Falstaff and the final run of John Copley's La bohème. Music Director Antonio Pappano will be celebrated, and will conduct six works, including four new productions. Mark Anthony Turnage's Anna Nicole will open The Royal Opera's Season with a performance exclusively for members of the ROH Students scheme. The Linbury Studio Theatre will also see a range of new commissions, from composers including Philip Glass and Harrison Birtwistle as well as the next generation of opera-makers. The Season sees many works on offer for young audiences, including a new opera for children aged 2 - 6 from Polka Theatre. Richard Jones directs his first Linbury productions: David Sawer's double bill, mad boy clever girl. 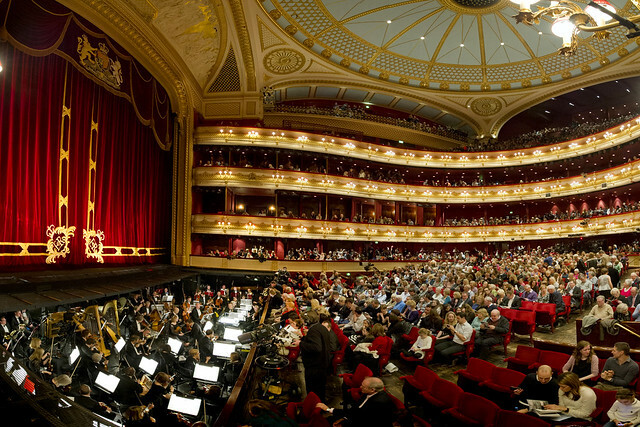 See full details of the 2014/15 Royal Opera Season, including casting. The Royal Ballet presents seven full-length ballets including Manon, Swan Lake and La Fille mal gardèe. A number of newly commissioned works will also be presented on the main stage and in the Linbury from choreographers including Wayne McGregor, Akash Odedra, Liam Scarlett and Hofesh Shechter. The Company will curate the Season-opening Deloitte Ignite Festival on the theme of myth. Over Christmas the story of Alice's Adventures in Wonderland will be told in Christopher Wheeldon's Alice's Adventures in Wonderland, and a new piece by ZooNation called The Mad Hatter's Tea Party. See full details of the 2014/15 Royal Ballet Season. Productions from both The Royal Ballet and Royal Opera will be relayed across the world as part of our Live Cinema Season. See full details. Booking details for Autumn, Winter, Spring and Summer Seasons are all available online, including Friends and General Booking dates. What are you most excited about in the 2014/15 Season? I quite agree so long as they give us a decent production, clearly set in the right time and with decent sets and costumes reflecting that. As an audience we need eye candy. all the finest singing and music in the world cannot succeed if we only have dark and minimalist sets to look at and with costumes that could have come out of the nearest charity shop. The ROH had a very good production of Chenier which hadn't had very many outings. Do we really need to have a lot of money spent on an opera which, superb as it is, will not be performed very often, based on past experience. Also reviving the old production will reduce the costs and may make the ticket prices more acceptable, unlike the highly inflated prices for Kaufmann's appearance in Manon Lescaut. You mention that it is the final run for John Copley's La Boheme. does that mean it is coming off the repertoire after this? Yes. It will be replaced by a production by Richard Jones in 2017. This is very disappointing. Copley's La Bohème is a superb production. Good sets, good costumes, well directed and which, in my opinion, epitomises what Puccini wanted. Having seen some of the less than satisfactory productions with which the ROH has replaced very good old ones, such as L'Elisir, Lucia di Lammermoor, Barber of Seville, Don Giovanni (Kaspar Holten's miserable offering) and Eugene Onegin to name but a few I shudder to think what the new Bohème will be like. I totally agree about Boheme. It is one of a mere handful of exemplary productions that still exist and 2015 will probably be the last time I ever see the work in the theatre. I am sure it will be replaced by a production that addresses "what was really in Puccini's mind" and as the story is about "human situations and emotions that are universal" it could easily be set on the moon or updated with the inevitable video projections, oppressive lighting etc. etc. Anything except even attempting to realize Puccini's vision. I find it all very depressing. There are so many operas I would like to see but so many productions of them that I will not waste my money on. Onegin is my favourite opera but I would never see Holten's production of it again. Once was bad enough. After a horrendous Manon Lescaut I have given up completely on WNO. I am giving the Royal Opera's Manon Lescaut a definite miss because it looks as if it will be dreadful. One waits years for this opera to be performed. Two productions come along in a single season and neither is fit to be seen. Opera North recently did an outstandingly good new production of Fanciulla. I am awaiting its programme for 2014/15 because it is my only hope of seeing a new production of an opera that is satisfactory. The day is not far off when, after a lifetime of indulging my passion for live opera, I shall prefer to stay at home and listen to my CD's. Scottish Opera once presented Turandot as an episode in the life of Puccini, and at the end the Calaf figure rejected the ice princess (=Puccini's formidable wife) and cradled the body of the dead Liu (=the servant whom the wife had accused of sleeping with Puccini). Obviously, Boheme is ripe for the same sort of insight. Rolando Villazón as Don Ottavio - hurrah! Thank you. - I want to buy my ticket now. It is such a treat to be able to see and hear him at the ROH. Interesting and exciting programme. I would really like to see Lady Macbeth of Mtsensk though. How disappointing to hear that the ROH are scrapping their star production of La Boheme. This wonderful production is indestructible and I remember a great series of 10-minute TV programmes for children built around a revival in 1995 with Cynthia Haymon and Roberto Alagna. Competent as it is, the Jonathan Kent production of Tosca has never matched the atmosphere and ambience of Zeffirelli's Tosca. Zeffirelli breathed Tosca and Puccini, just as John Copley does with his matchless La Boheme. I agree with David Patterson's comments. Not all but most new productions do not match the previous ones. The new Don Giovanni is appalling as is Lucia and the others. Very disappoointed that Charles Castronovo does not appear in the new season. Orfeo isn't the world's first opera or even the oldest surviving opera. I'm surprised that Kasper Holten doesn't know this. The ROH seems very hazy about opera pre-Mozart. I have am very privileged to be celebrating 66yrs. of Opera at Covent Garden ! My grandchildren are now the 4th. generation of my family to be in the audience ! What a delightful season to look forward to, my only hope is that we, the audience will not be assaulted and insulted by " weird productions ! With funds always in demand for our "House", I cannot understand the retirement of Boheme, or why we are not to have a revival of the Chenier production of which, I am sure we all have ! I sadly recall the exquisite Onyegin that we had when Cotrubas enchanted us with her Tatiana ! We have since suffered two productions of this great work, and a disasterous Aida, which we were told in "some way" to Japanese theatre ! I must sadly confess that it was the very first time that I booed at that dreadful first night ! I very recently "walked out" of the ENO Rigoletto ! ENO seems not to understand that the support of their audience is of critical importance, both for the support of Box Office sales, and further financial support ! The tolerance that we, the "public support" show has been stretched beyond the limits, not only in London, but so very recently in Germany ! I feel, that CV should try to listen, hear and take note of your always supporting, and at times some very disappointing "producers imaginations". With all good wishes, and assuring you of my ongoing full support, David Djanogly.